Climate Horror Stories That Wont Die: The Case of the Pika (Stewart, 2015). Because most people can’t fathom how 0.8 degrees of warming over a century can be lethal compared to far greater changes on a daily and seasonal basis, advocates of CO2 warming have littered the media and scientific literature with apocryphal stories statistically linking cherry-picked data with that small temperature rise and suggest wide spread future extinctions (i.e. Polar Bears, Walrus, Emperor Penguins, Edith Checkerspot, Moose, Golden Toad ). Pikas are another species that have been repeatedly targeted as an icon of impending climate doom. Pikas, or boulder bunnies, inhabit talus slopes (boulder fields) throughout western North America’s mountainous regions. Some suggest warming has been driving pikas up the mountain slopes, and they will soon be driven over the edge into the extinction abyss. Now once again, dubious science is pushing pikas as another canary in the climate coal mine. Although the evidence has not supported the pika’s demise, Stewart (2015) constructed a model that would, and he published their projections in Revisiting The Past To Foretell The Future: Summer Temperature And Habitat Area Predict Pika Extirpations In California. These researchers predict “that by 2070 pikas will be extirpated from “39% to 88%” of California’s historical sites. And once again the media is hyping that pikas are being pushed up the mountains to their doom. In contrast to the hype, Dr. Andrew Smith, the International Union for the Conservation of Nature pika expert, has testified that pikas are thriving in California and should not be listed. Although an avid defender of the Endangered Species Act, he argued that incorrectly listing the pika as endangered (see his letter here) would only subject the ESA to greater criticism and denigrate conservation science. Due to possible climate change concerns, the US Forest Service was obligated to extensively survey pika habitat throughout the national forests of the Sierra Nevada and the Great Basin. Supporting Dr. Smith’s views, in 2010 they too reported thriving pikas. Overall, only 6% of observed pika territories were vacant. Due to the lack of connectivity with other pika territories, when a pika dies the smaller more isolated territories suffer longer periods of vacancy. Accordingly, the USFS reported that vacancy rates increased as surveys moved from the Sierra Nevada with its large interconnected talus slopes to more isolated habitat in the Great Basin. In the Sierra Nevada the vacancy rate was just 2%, in the southwestern Great Basin vacancies increased to 17%, and vacancies were highest, 50%, in more isolated habitat of the central Great Basin ranges. The larger percentage of unoccupied sites east of the Sierra Nevada crest was typically due to the greater difficulty of finding and re-colonizing relatively small and isolated habitat. USFS surveys provided more damning evidence that would lead to rejecting the CBD’s lawsuits. The benchmark for wildlife abundance and distribution in California had been Joseph Grinnell’s surveys from the early 1900s. Contrary to global warming theory, the USFS survey found many new active pika colonies several hundred meters lower than Grinnell had documented. In total, 19% of the currently known populations are at lower elevations than ever documented by any study during the cooler 1900s. Further north in the Columbia River Gorge, another independent researcher also found pikas at much lower elevations, surviving at temperatures much higher than the models had predicted. Beever’s 2011 paper tried to counter those findings by arguing there was a nearly “five-fold increase in the rate of local extinctions and an 11-fold increase in the rate of upslope range retraction during the last ten years.” But Beever had badly manipulated his data. Surveying his 25 sites, he too had found 10 examples where pikas now inhabited lower elevations than previously documented. But he decided not to use those observations in his calculations. He, the editors and peer-reviewers unapologetically published his biased calculations to create his “11-fold increase in the rate of upslope range retraction”. Beever defended this statistical blasphemy by arguing pikas had likely always lived at those lower elevations, but had escaped detection by earlier observers (the equivalent of climate science infilling). Perhaps. It was possible. But by eliminating all new observations of pikas at warmer, lower elevations, he guaranteed their statistical upslope retreat. Here’s an example of his calculations: At Cougar Peak, a 1925 record documented the lowest elevation that pikas had inhabited was 2416 meters. Beever’s more recent surveys detected pikas living even lower on Cougar Peak at 2073 meters in the late 1990s, and at 2222 metes in follow-up surveys around 2003. Despite the fact that recent observations were all lower than 1925 by about 200 meters, Beever ignored the historical record. He simply subtracted the 1990s elevation from the 2003 elevation, to report climate had pushed pikas 149 meters higher. Furthermore, the Cougar Peak site was one of the sites Beever had initially reported as extinct. Follow-up surveys found a robust population. Vacant pika territories are natural and to be expected. Pika are very territorial and each year they drive their young away. Because pika live no longer than 7 years, (averaging 3 to 4 years in the wild), there is constant turnover at each site. A site remains vacant until a young pika, driven from another territory, randomly scampers into that vacancy and claims ownership. Without knowing how often a talus pile alternates between occupied and vacant, simply reporting observations of a vacant site tells us nothing about 1) why it is vacant, 2) when it was vacated, and 3) if it will soon be recolonized. Unfortunately vacancies have been misleadingly called extinctions. To illustrate, in the most recent paper by Stewart, his team initially found 15 vacancies, but a re-survey the following year, found that 5 of those sites were now re-colonized, a 33% reduction in “extinct locations” in just one year. Re-colonization has similarly undermined other classic doomsday stories. Parmesan’s iconic 1996 paper reported global warming had increased extinctions for the Edith’s Checkerspot butterfly, but most of those extinct colonies in the Sierra Nevada have now been re-colonized. Unfortunately the re-colonization information was never published. (read here and here). The IUCN’s Dr. Andrew Smith is the only researcher with results from long term pika monitoring that actually provides insight into the natural frequency of “extinction” and re-colonization. In California’s abandoned desert mining town of Bodie, pika have colonized discarded ore piles. Dr. Smith tracked the vacancy rates of 76 ore piles from 1972 to 2009. 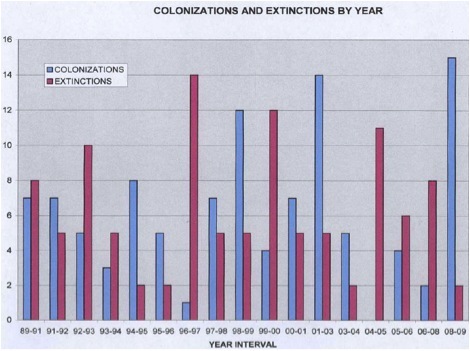 As expected, during those 37 years Smith observed 107 local extinctions, balanced by 106 re-colonizations. Like pika habitat elsewhere in the Great Basin, on average 30% of the ore piles were unoccupied at any given time, but that vacancy rate was highly variable. Some years the vacancy rate was as high as 52%, and other years as low as 11% (see chart below). In his first survey in 1972, Smith found that 82.3% of the ore piles were occupied by pika. In 2009, pika again occupied 82.8% of their possible sites. Coincidentally Stewart (2015) found 85% (57/67) of his re-surveyed sites are now occupied. Without accounting for such a wide range of variability, the percentage of vacant territories tells us precious little about any climate effects. But in contrast to Smith’s analysis, Stewart presented vacant territories as evidence of global warming caused “extinctions”. Although Smith’s research establishes a natural frequency of vacancy rates, it still doesn’t tell us why a site became vacant. In Beever’s 2003 paper, the seven “extinct” sites he attributed to climate change had other more plausible explanations. One site had half of the talus removed for road maintenance, another site had become a dump site, and a third site had scattered shotgun shells throughout the talus. Like rabbits, and a truly endangered species of pika in China, pikas have been hunted and poisoned because they compete with livestock for vegetation. All of Beever’s extinct sites were heavily grazed. Furthermore pikas do not hibernate. They create hay piles to sustain them through the winter. Any significant loss of vegetation will likely cause pikas to abandon their talus. Although studies have reported significant effects from grazing competition, Stewart (2015) did not include grazing as a variable in his climate change model. Stewart (2015) created a model that only included 1) area of talus and 2) summer mean temperature as the determinants of local pika extinctions. Assuming that model represents reality, they then argued that according to projected warming from CO2 driven models, pika will become increasingly “extirpated from 39% to 88% of these historical sites”. But talus area is the more critical variable, and the average summer temperature is highly questionable. Larger talus areas sustain more pika territories, and provide protection for dispersing young looking for vacancies. With more adjacent territories, there are more young pika who can immediately occupy any abandoned territory. In contrast the smallest talus areas, often sustaining just a single territory, are islands that lack connectivity to other territories. Vacant territories must wait to be randomly colonized by dispersing young from some distance talus. As the distance between isolated territories increases it is less likely that randomly dispersing young will recolonize a vacated territory. But the degree of connectivity was also never considered in Stewart’s model. As seen in his diagram below (I added the red lines for reference), the vacancies can be readily explained just by the talus area and random dispersal. 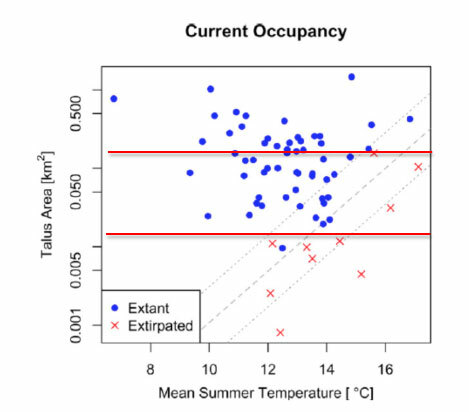 If the size of the talus area had been modeled as the only predictor of pika vacancies, any large talus area, (areas above the upper red line), would correctly predict full occupancy, accounting for 31% of the sites (20 of 67), regardless of temperature. Small talus area (areas below the lower red line) would correctly account for 70% of the vacancies (7 of 10 vacancies) regardless of temperature. In talus of intermediate areas, only 7% of the sites were vacant (3 of 39) which is close to the overall 6% finding of the USFS surveys. 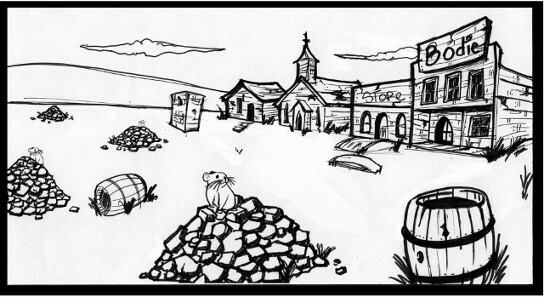 That 7% vacancy rate is easily accounted for by random extinction/colonization events, and the percentage is far better than vacancy rates Dr. Smith reported for Bodie’s ore piles. The higher temperatures reported at the 3 vacancies with intermediate talus areas may have been the result of a more barren dry landscape typical of the eastside of the Sierra Nevada. If so, lack of food, not higher temperatures may be the critical factor. Stewart never asks if the vacancies are due to higher temperatures, less reliable vegetation, or distance from other territories. Stewart’s model statistically linked higher temperatures to pika vacancies, but that link depends on what sites he includes or omits in his database. Beever’s data had similarly suggested higher temperatures were killing pika, but his analysis excluded data from nearby populations thriving at warmer and lower elevations just 93 miles away from 71% of Beever’s extinct sites. At Lava Beds pika were flourishing at an average elevation 900 feet lower than the average elevation of three nearby extinct sites. Temperatures at Lava Beds also averaged an additional 3.6°F higher, and precipitation was 24% less. But Beever analyzed those sites separately. Likewise Stewart was clearly more interested in a connection to global warming. In his introduction he speculated, “climate change forces range contractions, species may effectively be ‘pushed off’ the tops of mountains by warming climate.” He also referenced Parmesan’s bad climate science connection for support. 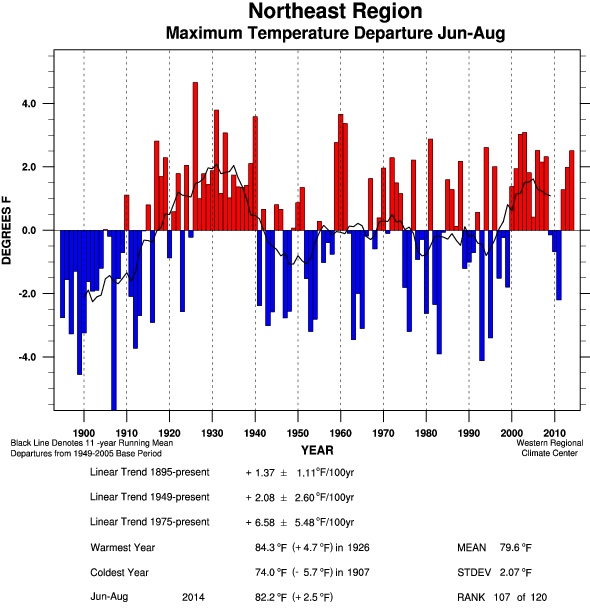 To create a link to global warming, Stewart needed to use average summer temperature as the other model variable. During high temperatures, heat-sensitive pika will seek refuge beneath the cooler talus. However Stewart argues such behavior reduces critical foraging time and thus possibly reduces winter survival. Perhaps. During extreme warm days, pika are known to become crepuscular, restricting their foraging to the twilight hours. However if that is the key mechanism, then using the average temperature is simply wrong. The average temperature is amplified by minimum temperatures of the early morning when overheating is not a problem. If Stewart was sincerely concerned about induced heat stress, then the correct metric would be the afternoon maximum temperatures. But maximums were not even considered in Stewart’s choice of models. Not considering maximum temperatures would seem shamefully negligent, but Stewart was aware that other studies had already determined no correlation with maximum temperatures. Stewart referenced Beever (2010) who wrote, “Although pikas have been shown to perish quickly when experimentally subjected to high temperatures, our metric of acute heat stress was the poorest predictor of pika extirpations.” Because maximum temperatures had revealed no acute heat stress, Beever adopted the term “chronic heat stress” which was just a more alarming way to say the average temperature. 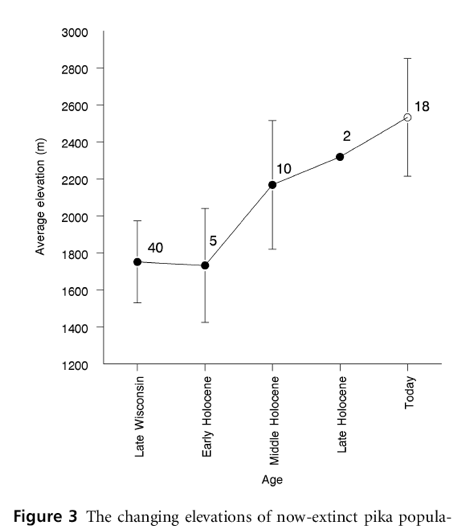 But even using average temperature, Beever still concluded, “Climate change metrics were by far the poorest predictor of pika extirpation.” Stewart’s own data supports the conclusion that climate metrics provided poor explanatory power. Stewart also cherry-picked a start date to argue, “documented 1°C increases in California-wide summer temperature over the past century, strongly suggest that pikas have experienced climate-mediated range contraction in California over the past century.” However if one examines the data Stewart links to for northeastern California, where most of their “extinctions” were observed, recent summer maximum temperatures have not exceeded the 1920s and 30s. If pika extinctions were truly “climate-mediated”, then the high temperatures of the 20s and 30s should have been the main driver. Furthermore during that 20s and 30s, pika experienced the most rapid temperature increases of about 2°C (4°F) in just 3 decades. Stewart made one more feeble attempt to justify using average summer temperatures. 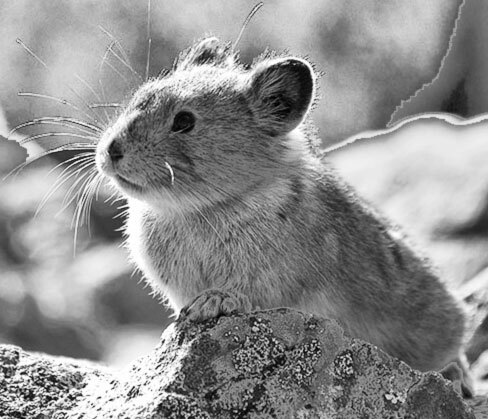 He reported that a 2005 paper by Grayson revealed pika have been forced to move ever upwards as climate warmed throughout the Holocene. (See graph below) But Stewart seems unaware that he damaged is own argument. Several studies, using proxies and models, have shown the Great Basin was warmer during the Middle Holocene by 1 to 2.5°C. Using Stewart’s logic, as global warming approaches temperatures seen in the mid Holocene, pika should descend to lower elevations. Although summer temperature data has very little predictive power regards pika biology, it was Stewart’s only link to CO2 climate models. Using that dubious link to summer temperatures, he projects impending climate doom and widespread pika extinctions. But if Stewart was truly concerned about preserving pikas, instead of preserving CO2 theory, then all the data suggests small talus areas that are subjected to grazing are the relevant concern. To protect the pikas’ forage, simply fencing off livestock from the edge of those small talus slopes would be a simple affordable solution. Stewart’s own data also suggests, along with the USFS surveys, that wherever there is large talus area, there has been nothing to suggest imminent extinctions. So why does the pikas’ climate change extinction story persist?